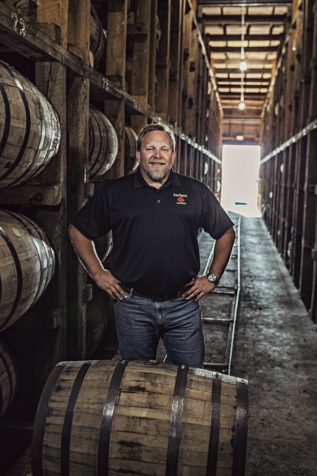 As we kick off the new year, we thought it’d be a good time to sit down with Four Roses Chief Operating Officer Ryan Ashley to get the latest update on the major expansion of our Distillery in Lawrenceburg, Ky. Let’s take a look at what he had to say. We’re very excited for the new year, here at Four Roses Distillery, as it brings many changes to our ever-growing facility. Anyone who has visited the Four Roses Distillery recently can attest to the numerous new buildings that have seemingly morphed into the existing facility. Our fermentation space has more than doubled in size and is beginning to take shape on the exterior, following the same architectural lines and details as the original Spanish-mission style Distillery building. Large windows allow natural light to illuminate the room, as well as allow a view from the outside. Within the walls of the fermentation space, we have added more chilling units to allow us to process our cooks at a consistent speed and temperature year-round, regardless of the temperature outside or in our river. Alongside the new chilling units, we have begun to add to our fermentation tank inventory—seven new fermenters are in place and 18 more will follow in the future! Once complete, the fermentation space will again be open to our guests. This is my personal favorite spot to take in the action, as our guests will be able to visually partake in the various states of fermentation and take in the different aromas as each fermenter transforms to distiller’s beer. The interior of the Distillery has changed the most throughout the expansion project. In the first quarter of this year, we are happy to share with our visitors, family and friends all that has been added. We have an additional cooker, additional beer column still and doubler still. The entire tour route has been upgraded to allow for visitors to fully experience the cooking and distillation process up close and personal. The tour platform will allow Bourbon fans to experience a 360-degree view around every still, tail box and condenser. The main platform will be an excellent tour stop and photo opportunity to showcase all the copper and distillation action. All in all, this is a very busy, but exciting time at Four Roses. As we produce this season, we will continue to add to the facility to accommodate our targeted completion later this year—we plan to have everything operational by the beginning of 4th quarter 2018. Feel free to stop by throughout the year and experience our growth and have a sip of some the world’s finest Bourbon, you’re always welcome! Take a look here for more information on our tours that are being offered at this time.